Over the course of eight years and three albums Dengue Fever have neatly made a career out of mining the sounds of Cambodian rock & pop prior to the reign of the Khmer Rouge. Being so it’s only fitting they were chosen to curate Electric Cambodia — a fourteen track compilation LP to benefit the Cambodian Living Arts. 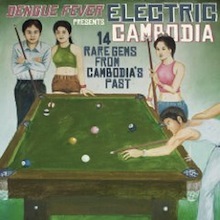 Billed as “14 Rare Gems From Cambodia’s Past” the set acts as a primer for those who have yet to stick their big toe into the waters of the Cambodian Cassette Archives or other similar sets. With Dengue Fever’s popularity having grown outside the NPR set the past few years, the group is in a unique position to shed light on the artists/movement that spawned their sound. These tracks were recorded in the 1960s and early ’70s soon after Cambodia became an independent nation. “A period of rapid modernization that not only influenced music, but also architecture, sculpture, painting, and cinema. Cambodia’s own artistic renaissance, this era came to a sudden end when the Khmer Rouge took control of the country in 1975 and brutally attempted to destroy any trace of modern society.” That is the 10,000 foot view of the political situation surrounding the music, a story Dengue Fever expand on in their 2008 documentary Sleepwalking Through the Mekong. Both Electric Cambodia and Sleeping Through the Mekong are out now. If you’re here in Los Angeles, Dengue Fever are set to perform Saturday night at the KCRW Haiti Relief Concert at the El Rey Theatre. Just heard the review of this album on Weekend Edition. What an amazing piece of work and hats off to Dengue Fever for making this happen. Now, WHY CAN’T I FIND THIS ALBUM ON ITUNES!